What on earth is a "chamallow", Mr. P?! I also had one of those science-y grow your own crystal kits as a kid. I grew the yellow crystal mix in my bedroom window until someone mistook it for a cup of urine and then it had to go. haha! soooo cute! i loved watching that cartoon as a kid! I was a massive smurf book fan at age of six though they really annoy me when you hear them speak - Father Abraham in Smurfland album excepted. I recently discovered the dipping rather than sprinkling method, it is much tidier. 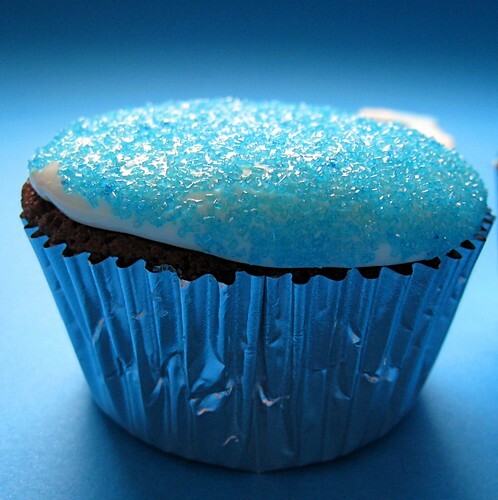 These look great, I would love to know where you got that blue sugar? There was an urban legend going around about Smurf dolls coming to life and biting kids in their beds when I was a little girl. Almost none of the kids I knew had one as a result. Not even joking. 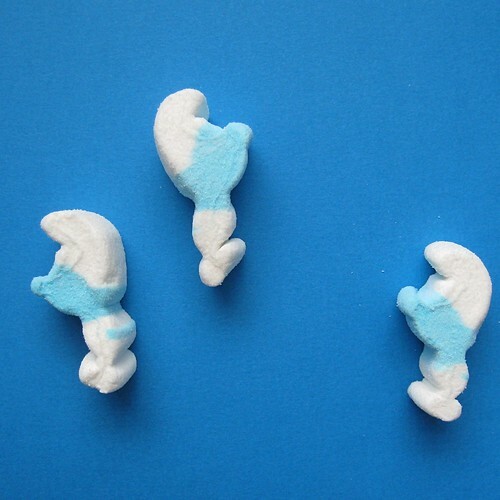 I've never had Smurf marshmallows before, but the same company makes Smurf gummies, which I have had. Also, am pretty sure I never had one of those crystal kits, but my brother and I used to grow rock candy on a string hanging in a sugar solution. My parents liked it; kept us quiet. I'm sorry the cake recipe didn't work out for you. I have my go-to chocolate cake recipe that uses boiling water and it's always been awesome. Oh well, they're super cute anyway! I believe that must be Italian for marshmallow, Ms. H. I found them in Italy you see. Judy - I just got your package in the post! I am so excited I can hardly wait. I am going to wait until after my decorating class on 10 March to use it. You'll be the first to see the results! Sarah - They are the David Beckham of the cartoon world. (Re: annoying voices). However, I still like them. The blue sugar was from NYC. I'm sorry. You can make sanding sugar though. Just add colour paste to regular sugar and mix. Mike - Smurf torture! I like it. They are going on my hot chocolate later. Mae - You just made me laugh out loud. At least we had our Popples, right? Katie - Can't even bear how much I want to try growing rock candy! You have planted a seed. Pom - Is that on your blog? Would you share it with me? Sexism! 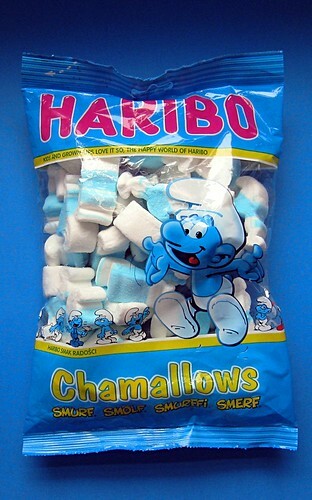 Haribo doesn't make Smurfette marshmallows? I have checked: in Paris, you can get Smurfette and Papa Smurf versions of the gummies. I strongly suspect we are deprived of smurf marshmellows here in New Zealand, I've never seen them. The colour of those little cakes is strange.. you know you should not eat things that particular shade of blue .. but you just desperately want to. I love them! I would have eaten the science stuff too no doubt. Smurf marshmallows? So cool. Probably take years off your life but some things are worth it. Things like eating smurfs. And yes, booze will solve many of life's problems, dry cakes included. You could also solve this problem by drenching your mouth in liquer before sticking a dry cake in. OMGGGGGGGGGG as soon as i read the title i had the theme tune in my head!! dont worry about the hoarding thing i do it too! my excuse is that it is a cancerian trait! I go into town,and i buy things,and i hide them so they never get used..sad i know. What a great story and I love the look of your cupcakes. OMG. If you send me some of those Haribo Smurfs, I will seriously pay you. Seriously. Mardi - I am not there now, but I did go to all the places you mentioned, and cried when I didn't have enough money or suitcase space to buy anything. I was this close (you can imagine my fingers being very close together here) to some brulée dishes though. Next time. When I don't have kitchen fitters to pay! I want me some DSmurf marshmallows! How fab are they? I impusle buy all kinds of stuff - from heart lollies for Valentines Day cakes (even if it is nearly 12 months away!) to dried rose petals to pear flavouring (for who knows what project?). OMG I want to mallows!! These are so cute! I love them!! 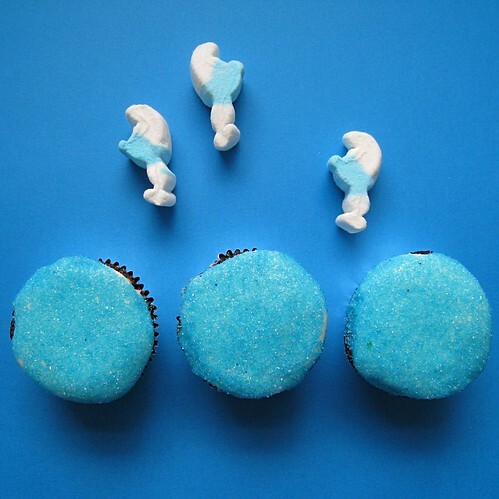 I found these smurf mallows too in Belgium and was ridiculously excited with them so bought them intending to turn them into cuter than cute cupcakes..but they didn't make them home with me as i ate them all! love your sanding sugar too, where do you buy it? I thought you could only get it in the states. soooo awesome I blogged about it! Very cute! I loved smurfs. Great job. I saw your great photo on refrigerator soup. I loved (LOVED) the Smurfs as a child. 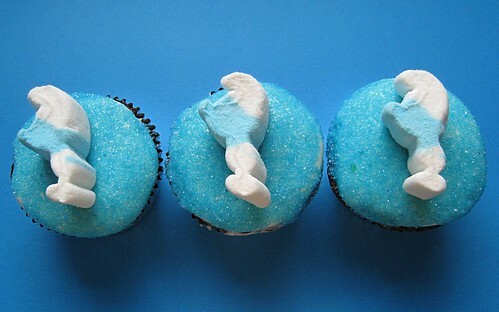 I got a big kick out of these cupcakes and am wishing for Smurf marshmallows. These made my day - I'm going to make a batch. The Smurfs remind me of when I was a kid. Brainy Smurf was my all-time favorite. Oh, don't forget Gargamoyle!! I loved the smurfs when I was a kid! I collected all the little figures. 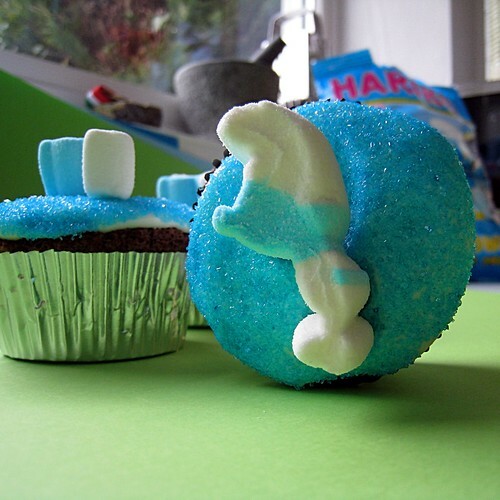 I am going to make it my mission to find these smurf marshmallows! Any idea where I can can get the Smurf Marshmallows?? It's my son's birthday coming up & he want me to make your wonderful cupcakes!! 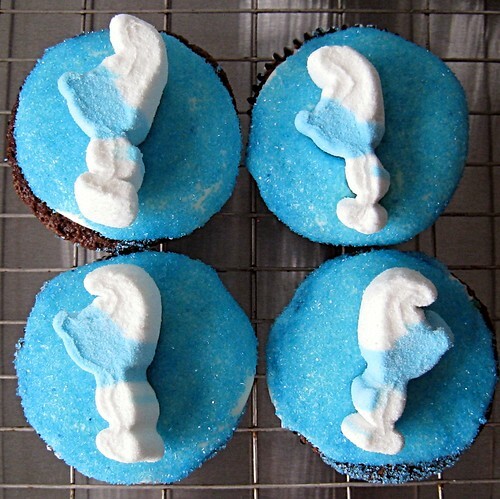 I just recently watched the smurfs 3D with my kid and I think these cupcakes are exactly what we need to make this weekend lol. I like these cakes. Sweet and good.